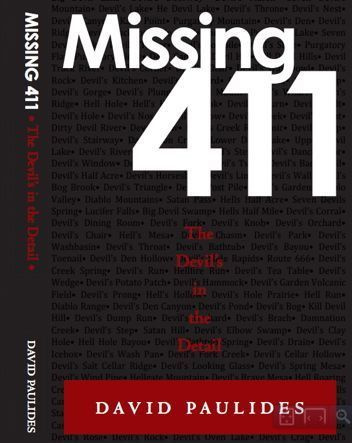 After reading David Paulides' fourth book, "The Devil's in the Detail", I sat stunned contemplating the 'where' and 'how' questions of the missing people documented in the "Missing 411" books, knowing those answers could well turn our entire idea of reality and perhaps even religion upside down. The weight of those thoughts was paralyzing so I brought myself back to 'reality' by turning on my laptop and checking a current news website for weather updates, etc..I needed to read something mundane to flush my thoughts of the missing away. But what was plastered across the computer screen was not predicted storms in the southern states but the headlines: "Search continues for Missing California off-duty Firefighter in Los Padres National Park". I could not believe what I was seeing just a couple of minutes after finishing Paulides fourth book! I thought, 'Dear Lord, it is real and it's happening now.' Every characteristic of the off-duty firefighter's disappearance had been covered over and over again by Paulides. "Avid outdoors-man vanishes while chasing his dog into a creek in remote National Park in rugged boulder-strewn terrain...". Obviously the SAR team's bloodhounds have not picked up the man's scent (yet another characteristic Paulides emphasizes) because it's been a week now and he's still missing. The fire-fighter ran off with no shoes on. Time and time again Paulides found that many of the missing were barefoot or had for some bizarre reason ditched their shoes or boots. What compelled this man to chase his dog into the wilderness with no shoes on his feet?! It's one thing to read about cases that happened in the past, but to know that a current case is making headline news at this very moment is absolutely disconcerting and utterly terrifying! I was so moved after watching news clips regarding search efforts that did something completely out of character and called the Ventura County Search & Rescue office to urge them to read the 'Missing 411' books and to contact Mr. Paulides. Someone needs to tell them about the many missing persons who have been found way beyond what the search parameters may indicate and to concentrate on the areas near creeks or dry creek beds. I pray this young man is located but it isn't looking very good. I just wish someone in the search team had read Paulides books.